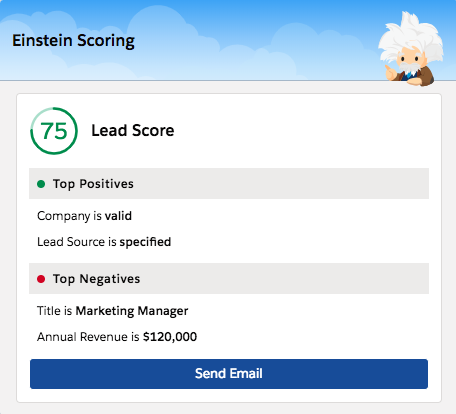 Now that you’ve configured Einstein Lead Scoring, Belle wants to test your admin skills. The process you created in the previous step looks great, but does it work? Luckily, Belle has two new leads that she’d like to add to Salesforce. Let’s see what happens when Einstein Scores these leads. Click to open App Launcher, then click Sales. If you get a pop-up welcoming you to Salesforce, click the X to close the window. Click the Leads tab. Click New and fill out the following details. 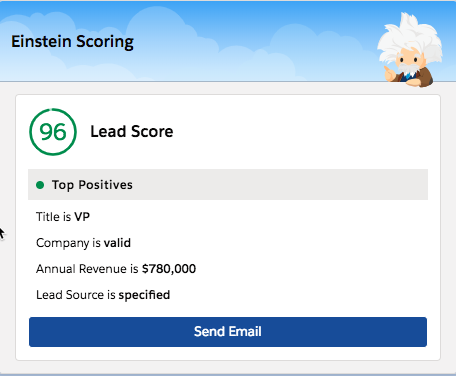 Notice that you can now see Einstein Scores populated for your two new leads. Cool! Before we dive deeper, let’s ensure our new lead record detail pages include insights so we can show Belle the key factors behind Einstein scores. On detail pages in Lightning Experience, the lead score appears in the Einstein component. The component also shows sales reps which lead fields have the greatest positive (1) or negative (2) influence on its score. Fields that aren’t listed in the Einstein component still influence the score, but less than the fields listed. Check the Lead Record Page for the Einstein component. Click and then select Setup. In Quick Find, type Lightning App Builder, then select Lightning App Builder under User Interface. Click Edit next to the Lead Record Page. Verify that the Einstein component is displayed on the right-hand side of the page Lead Record Page. Click Save. Once your changes are saved, click the Back button. Now that we have two new leads, let’s take a deeper look at their Einstein Scores. Click to open the App Launcher, then click Sales. Click your lead, Biff Jurkey. Click Details and verify our process is working correctly—the Lead Owner is set to Lead Queue because the Einstein Score is below 80. Click the Leads tab, then select John Cliffberg. Click Details and verify our process is working correctly—the Lead Owner is set to Belle Pepper because the Einstein Score is above 80. It works! You’re able to see your process in action and discover the factors that contribute to your Einstein Lead Score through Lead Insights. Thanks to your friend Einstein, Belle is now able to prioritize her day and focus on only high-value leads.